On the other hand, Recaredo18 developed an eso sinus tarsi technique for limiting motion in the subtalar joint: the calcaneo-stop procedure. He inserted a cancellous screw into the calcaneus bone to interfere with talus movement in proximity of the screw head. The entry point was located in the sinus tarsi. Magnan and colleagues19 reported 83% good results in 475 cases with 12 to 112 months follow-up time with this procedure. 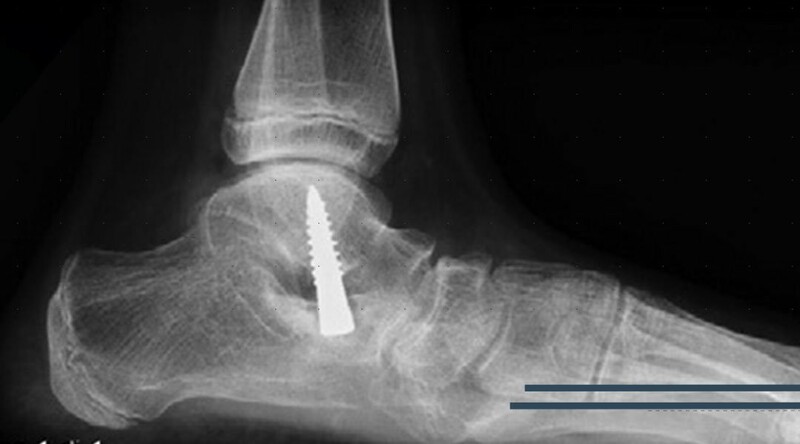 Castaman20 described a modification of this technique using a cancellous screw inserted into the talus (anterograde calcaneo-stop) with Roth21 reporting excellent results in 48 children (94 feet) in 91.5% of the patients with a 5-year average follow-up. An interesting phenomenon described for both endo sinus tarsi arthroereisis22 and eso sinus tarsi calcaneo-stop23 procedures is the maintenance of the correction even after hardware removal. It is likely that this finding had biomechanics and neuropro- prioception explanations. In this light, Scarpa’s31 observations of nearly 200 years ago are really quite interesting, noting similarities between subtalar and hip joints. He compared the acetabulum to the so-called acetabulum pedis, made up of navicular, spring ligament and anteromedial and anterolateral calcaneal subtalar articular facets. The hip is, of course, a pure ball-and-socket joint with one central rotation between two bones with an intraarticular ligament and an articular capsule, whereas the subtalar joint is not. In any case, embryologic and histologic reasons drove Pisani32 to stress this idea, introducing the term coxa pedis, which describes the subtalar joint as a reverse hip. Although the foot is not a single bone, Paley’s38 concept of the center of rotation of angulation (CORA) of the deformity can be applied to the foot as well. Considering that, in flatfoot deformities, the intersection site of talus and first metatarsal axis happen mostly at talonavicular joint, biomechanically the calcaneo-stop procedure acts at the CORA of the deformity. According to Pisani’s theory, Koutsogiannis-Myerson calcaneal medial displace- ment osteotomy39 is comparable to Chiari’s pelvis osteotomy,3 whereas a successful arthroereisis procedure for the hip is still missing. This result represents the success factor of this minimal invasive procedure, especially considering Nigg’s40 biomechan- ics study. In fact, Benno Nigg confuted the old podiatric idea that ground reaction forces on the forefoot significantly affect foot function according to the position of the oblique Lisfranc joint axis,41 subsequently applying the concept of rigid body rotating around subtalar joint axis to the foot complex.42 This theory fits for every structure whose component deformations are insignificant compared with the motion of the entire structure as one entity. Hence, biomechanically speaking, calcaneo-stop is a minimally invasive procedure that acts at the CORA of the deformity in a constraint structure. Many investigators claim a proprioceptive function for the calcaneo-stop proce- dure,2,4,15,19,20,23 emphasizing proof that with this active self-correction there is weak screw penetration in the calcaneus and a relatively small percentage of screw breakage, compared with what can be expected from a purely passive mechanical mechanism. Similar observations find their scientific explanation in Japanese neurohistologic studies.45 Neural structures were found in 22 cadaveric feet, after gold chloride impregnation. Most of these structures were free nerve endings for nociception, but it was also possible to identify mechanoreceptors as Pacini, Golgi, and Ruffini corpuscles. This special group of neuronal cells can be activated by any external stimulus (such as sight stimulus, but even proprioceptive stimulus) and facilitates adaptive active changing in the whole body. However, this is still a hypothesis. The authors advocate further studies to better acknowledge this one last principle. There is, on the contrary, an abundance of studies advocating the absolute inefficiency of conservative treatments (shoe modifications and insoles) for correction of flatfoot deformity, with the exception of heel cord stretching exercise in case of concomitant Achilles brevis.27,28,29 Furthermore, according to Morley,3 nearly 100% of 2-year-old children are flatfooted, with a drop to 4% at age 10. This incidence makes it even more difficult to choose the correct timing in the decision-making process. Nowadays the problem for the physician is more difficult than in the past. The choice is no longer between conservative and surgical treatment, but whether to treat the patient or not, and, if so, when. As in the past, clinical features are more important than any other assessment. Radiographs should not dictate treatment,3 even with abnormal values. Whereas radiographs are effective in defining static relationship between bones, absolutely no information on pain, flexibility, or function is provided. Finally, the optimal timing for this surgery is debated. Good results have been reported in the 8 to 14 age group,4,20 but Carranza and colleagues48 suggest performing the operation around age 12 to avoid the development of cavovarus deformity in those feet operated on at a very early age, as reported by Viladot.15 On the other hand, Roth and colleagues4 argued that, for patients older than 14 years, not enough correction could be reached because of the limited bone growth potential. Therefore, considering the number of variables in this decision-making prog- ress, it is extremely important that the referring physician for these little patients and their parents be a well-trained orthopedic surgeon skilled in foot and ankle and/or in pediatrics, rather than any other health care provider. There is scarce literature on arthroereisis procedures in adults, with most reports being related to endo sinus tarsi arthroereisis procedures. In these cases, the main concern should not be the satisfaction rate at a short-time follow-up, but the removal rate. In an adult-structured foot it is difficult to imagine a proprioceptive active correction, and it is reasonable that the biomechanical impact be predominant. Therefore, there is clearly a high risk of correction loosening due to implant removal. According to these principles, in a study conducted on 23 adults, Needleman5 referred to 46% of sinus tarsi pain at an average follow-up of 44 months. He reported a 39% implant removal rate with sudden improvement of functional scores and symptoms release. Theoretically, the calcaneo-stop procedure, being completely extraarticular, should result in less biomechanical stress symptoms and presumably work better than other endo sinus tarsi arthroereisis procedures.2 Nevertheless, this theory, as well as its surgical indications, has yet to be documented. In any case, arthroereisis cannot be a stand-alone procedure in adults but must be considered as a CORA38 procedure in protection of other soft tissue CORA proce- dures (spring ligament repairing, for instance) and associated with other procedures that address proximal and distal pathologic conditions. On the anteroposterior view it is important to consider the percentage of talar head uncoverage, often revealing which surgical management is more fitting following surgical indication. Castaman20 and other investigators4 popularized the anterograde calcaneo-stop technique with apparently a shorter incision (around 1-cm) centered on sinus tarsi (Fig. 2). Once the lateral process of the talus is located, under fluoroscopy, an entry hole with a trocar is performed into talus. Then a 6.5 cancellous screw is inserted at a 35°direction in the sagittal and 45° in the coronal plane. The length of the screw is similar to the original technique with the nonthreaded portion conflicting with the lateral border of the calcaneus. 7.45% screw malposition, posing the risk of damaging both the subtalar and ankle joints (Figs. 3–5). Any remodeling activity in adult hindfoot is not to be considered. Hence, the main concern should be the removal rate, which has been described by Needleman5 for endoarthrorereisis procedures in adults at around 39%. Theoretically, this rate should be lower in the calcaneo-stop technique. The most common complications in endorthesis, such as granuloma formation, implant dis- placement, biomaterial failure, tissue staining, implant irritation, and sinus tarsi pain, would not be expected with calcaneo-stop.2 Regardless, this expectation is still a hypothesis and not a documented fact. The authors recommend considering calcaneo-stop in adults as a possible accessory procedure to protect a medial soft tissue repairing, to be combined with any bony procedure necessary to achieve a plantigrade foot. Anterograde calcaneo-stop: screw malpositioning on the contralateral side of the same patient. Computed tomography scan: anterograde screw malpositioning (same patient). Children outside the mentioned age group (8 –14 years) represent a contraindica- tion for this surgery. In patients undergoing the surgery too early, Viladot15 described the risk of developing a cavovarus foot later in life. On the contrary, once the patient is too old, there is no more modeling residual potential. Finally, both neurologic and neuromuscular diseases are contraindications. Considering that this procedure in some way limits subtalar joint movement, subtalar and midfoot arthritis represent a contraindication to this surgical choice for the major stress incurred after this procedure. Rigid flatfoot and neurologic and neuromuscular diseases are absolute contrain- dications for this surgical treatment. All the previous studies reported a significant statistical improvement of the Meary angle around 15° with, once again, similar results for endorthesis. Few pedographic studies are present in literature. The most relevant one available, by Kellermann and colleagues4 shows a significant change for “relative contact time” with a postoperative increase in the lateral midfoot region (this parameter represents the actual contact time of the region divided by the contact time of the total foot in percent). In addition, these implants lead to resorption of the adjacent cortical surface of the talus and calcaneus. At this time the authors cannot predict the long-term effect of this occurrence. Short-, medium-, and long-term follow-up studies are missing.3 To estimate the hypothetical advantage of this procedure we must to refer to endorthesis results and problems according to short-term follow-up studies. Needleman5 refers to a lower satisfaction rate than in children (78%), with sinus tarsi pain in 46% and hardware removal in 39% at 44-month follow-up. These studies can be explained through magnetic resonance imaging studies by Saxena and Nguyen,56 who recently found that the tarsal canal is smaller in height and length than the implants sizes generally used. Theoretically, the calcaneo-stop technique, being totally extra sinus tarsi, should not have this problem. In any case, with such a high rate of hardware removal expected and the potential high risk of residual deformity, the calcaneo-stop procedure should be considered a procedure acting at the CORA of the deformity, to be associated with any soft tissue and bone procedures necessary to obtain a well-aligned plantigrade foot. Flexible flatfoot is one of the most common deformities. Arthroereisis procedures are designed to correct this deformity. Among them, the calcaneo-stop is a procedure with both biomechanical and proprioceptive properties. It is designed for pediatric treatment. Results similar to endorthesis procedure are reported. Theoretically the procedure can be applied to adults if combined with other procedures to obtain a stable plantigrade foot, but medium-term follow up studies are missing. Pfeiffer M, Kotz R, Ledl T, et al. Prevalence of flat foot in preschool-aged children. Pediatrics 2006;118:634 –9. Kwon J, Myerson M. Management of the flexible flat foot in the child: a focus on the use of osteotomies for correction. Foot Ankle Clin N Am 2010;15:309 –22. Mosca VS. Flexible flatfoot in children and adolescents. J Child Orthop 2010;4: 107–21. Roth S, Sestan B, Tudor A, et al. Minimal invasive calcaneo-stop method for idiopathic flexible per planovalgus in children. Foot Ankle Int 2007;28(9):991–5. Needleman RL. Current topic review: subtalar arthroereisis for correction of flexible flatfoot. Foot Ankle Int 2005;26:336 – 46. Grice DS. An extra-articular arthrodesis of the subastragalar joint for correction of paralytic flat feet in children. J Bone Joint Surg Am 1952;34-A:927–56. Brown A. A simple method of fusion of the subtalar joint in children. J Bone Joint Surg Br 1968;50-B:369 –71. Pollock JH, Carrell B. Subtalar extra-articular arthrodesis in the treatment of paralytic valgus deformities: a review of 112 procedures in 100 patients. J Bone Joint Surg Am 1964;46-A:533– 41. Tohen A, Carmona J, Chow L, et al. Extra-articular subtalar arthrodesis: a review of 286 operations. J Bone Joint Surg Br 1969;51-B:45–52. Hsu LC, Yau AC, O’Brien JP, et al. Valgus deformity of the ankle resulting from fibular resection for a graft in subtalar fusion in children. J Bone Joint Surg Am 1972;54-A: 585–94. Gross RH. A clinical study of the Batchelor subtalar arthrodesis. J Bone Joint Surg Am 1976:58-A:343–9. Dennyson WG, Fulford GE. Subtalar arthrodesis by cancellous grafts and metallic internal fixation. J Bone Joint Surg Br 1976;58-B:507–10. Haraldsson S. Operative treatment of pes planovalgus staticus juvenilis. Acta Orthop Scand 1962;32:492– 8. Lelievre J. The valgus foot: current concepts and correction. Clin Orthop 1970; 70.43–55. Viladot A. Surgical treatment of the child’s flatfoot. Clin Orthop 1992;283:34 – 8. Subotnick S. The subtalar joint lateral extra-articular arthroereisis: a follow-up report. J Am Podiatry Assoc 1977;32:27–33. VanAman S, Schon L. Subtalar arthroereisis as adjunct treatment for the type II posterior tibial tendon insufficiency. Techniques in Foot Ankle Surgery 2006;5: 117–25. Alvarez R. Calcaneo stop. Tecnica personal para el tratamiento quirurgico del pie plano-valgo del nino y adolescente joven. In: Epeldelgui T, editor. Pie plano y anomalias del antepie [in Spanish]. Madrid (Spain): Madrid Vicente; 1995. p. 174 –7. Magnan B, Baldrighi C, Papadia D. Flatfeet: comparison of surgical techniques. Result of study group into retrograde endorthesis with calcaneus-stop. Ital J Pediatr Orthop 1997;13:28 –33. Nogarin L. Retrograde endorthesis. Ital J Pediatr Othop 1997;13:34 –9. Kellerman P, Roth S, Gion K, et al. Calcaneo-stop procedure for paediatric flexible flatfoot. Acta Orthop Trauma Surg 2011;11:1316 –3. Zaret DI, Myerson MS, Arthroereisis of the subtalar joint. Foot Ankle Clin 2003;8: 605–17. Pisani G. About the pathogenesis of the so-called adult acquired pes planus. Foot and Ankle Surg 2010;16:1–2. Bone Joint Surg Am 1988;70:407–15. Steel MW 3rd, Johnson KA, DeWitz MA, et al. Radiographic measurements of the normal adult foot. Foot Ankle 1980;1:151– 8. Wenger DR, Mauldin D, Speck G, et al. Corrective shoes and inserts as treatment for flexible flatfoot in infants and children. J Bone Joint Surg Am 1989;71:800 –10. Helfet AJ. A new way of treating flat feet in children. Lancet 1956;1:262– 4. Rao UB, Joseph B. The influence of footwear on the prevalence of flat foot. A survey of 2300 children. J Bone Joint Surg Br 1992;74:525–7. Driano AN, Staheli L, Staheli, LT. Psychosocial development and corrective shoewear use in childhood. J Pediatr Orthop 1998;18:346 –9. Richardson RS. Foreword. Foot and Ankle Clin 1998;3:13. Scarpa A. A memoir on the congenital clubfeet of children, and of the mode of correcting that deformity. 1818. Pisani G. Peritalar destabilization syndrome (adult flatfoot with degenerative glenopa- thy). Foot Ankle Surg 2010;16:183– 8. Pisani G. La “coxa pedis” e i momenti torsionali astragalici. Chir Pied 1987;11:35– 8 [in Italian]. Tryfonidis M, Jackson W, Mansour R, et al. Acquired adult flat foot due to isolate plantar calcaneo-navicular (spring) ligament insufficiency with a normal tibialis poste- rior tendon. Foot Ankle Surg 2006;14:89 –95. Basmajian JV, Stecko G. The role of muscles in arch support of the foot. An electromyographic study. J Bone Joint Surg Am 1963;45:1184 –90. Mann RA. Biomechanics of the foot and ankle. In: Mann RA, editor. Surgery of the foot. St Louis (MO): CV Mosby; 1986. p. 1–30. Inman VT. The joints of the ankle. Baltimore (MD): Williams and Wilkins; 1976. Paley D. Principles of deformity correction. Berlin: Springer-Verlag; 2002. Koutsogiannis E. Treatment of mobile flat foot by displacement osteotomy of the calcaneus. J Bone Joint Surg Br 1971;53-B:96 –100. Nigg BM. Mechanics. In: Nigg BM, Herzog W, editors. Biomechanic of the muscolo- skeletal system. 2nd edition. New York: John Wiley and Sons; 1994. p. 36. Manter JT. Movements of the subtalar and transverse tarsal joints. Anat Rec 1941; 80:397. Huson A. Functional anatomy of the foot. In: Jass MH, editor. Disorder of the foot and ankle. Philadelphia: WB Saunders; 1991. p.409. Cornwall MW, McPoil TG. Three-dimensional movement of the foot during the stance phase of walking. J Am Podiatr Med Assoc 1999;89:56. Kirby KA. Biomechanics of the normal and abnormal foot. J Am Podiatr Med Assoc 2000;90:30. Akiyama K, Takakura Y, Tomita Y, et al. Neurohistology of the sinus tarsi and sinus tarsi syndrome. J Orthop Sci 1999;4:299 –303. Molenberghs P, Hayward L, Mattingley JB, et al. Activation patterns during action observation are modulated by context in mirror system areas. Neuroimage 2011 [epub ahead of print]. Carranza A, Gimeno V, Gomez JA, et al. Giannini’s prosthesis in the treatment of juvenile flatfoot. J Foot Ankle Surg 2000;6:11–7. Malicky ES, Levine DS, Sangeorzan BJ. Modification of the Kidner procedure with fusion of the primary and accessory navicular bones. Foot Ankle Int 1999;20:53– 4. Meary R. On the measurement of the angle between the talus and the first metatarsal. Symposium: Le Pied Creux essential. Rev Chir Orthop 1967;53:389. Hoke M. An operation for correction of extremely relaxed flat feet. J Bone Joint Surg 1931;13:773– 83. Miller GR. The operative treatment of the hypermobile flat-feet in the young child. Clin Orthop Relat Res 1977;122:95–101. Saltzman CL, Khoury NJ. The hindfoot alignment view. Foot Ankle Int 1995;16(9): 572– 6. Kidner FC. The pre-hallux (accessory scaphoid) in its relation to the flat foot. J Bone Joint Surg 1929;11:831–7. Strayer LM Jr. Recession of the gastrocnemius: an operation to relieve spastic contracture of the calf muscles. J Bone Joint Surg Am 1950;32-A:671. Saxena A, Nguyen A. Preliminary radiographic findings and sizing implications on patients undergoing bioabsorbable subtalar arthroereisis. J Foot Ankle Surg 2007; 46(3):175– 80.